Tendo (天童) is located in the middle of Yamagata Prefecture. Tendo is the most famous are of Shogi, Japanese Style Chess, Pieces Production. Over 90% of Shogi Pieces in Japan are made in Tendo. 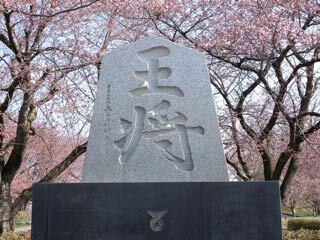 The history of Shogi began with Oda Nobumichi, the descendant of Oda Nobunaga. Because current Shogi Style was invented by Ohashi Soke who is samurai of Nobunaga, and Nobunaga admired Shogi for Samurai's strategy training, Nobumichi stared encouraging all Samurai to make Shogi Pieces without having any dishonoring. There are many Shogi shops in Tendo. There is a human Shogi Festival in April at Maizuru Park. Tendo's Shogi started during the end of Edo Period. It was Samurai's work. Oda Nobumichi, the descendant of Nobunaga, encouraged all Samurai to make Shogi Pieces for making living. He told them that there is nothing to be ashamed to do such a low works because Oda Nobunaga admired Shogi for great way of Samurai's strategy training, and Nobunaga played Shogi many times. This call became tradition in Tendo's Samurai. Today, all Shogi Pieces in Tendo are hand made with the descendants of Tendo's Samurai. Today, Tendo's Shogi are still made by Samurai. ... is Tendo's lucky Shogi Pieces. It means bringing good luck because sound of reversed horse is "Ma u" which means dancing. Also, the font looks a wallet. Therefore, this is also good for business. ... is enshrined Oda Nobunaga. It is the main shrine of Oda Nobunaga. Human Shogi Festival is held under Takeisao Shrine at Maizuru Park. Tendo is also Onsen Town. Many of Hotels have Onsen and there is public Onsen, too.